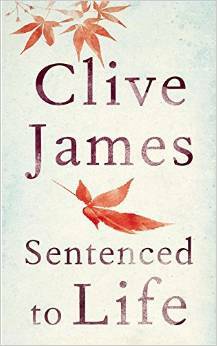 Clive James was diagnosed with leukemia and emphysema several years ago, but the poet, essayist, memoirist, novelist, TV host, and charter member of the Virtual Memories Show Dream List hasn’t let his ailments silence him. We got together at his home in Cambridge in February for a wide-ranging conversation about poetry, mortality, binge-watching Veronica Mars, writing Cultural Amnesia (one of my favorite books), being Australian despite 50 years in the UK, the impact of his showbiz career — good and bad — on his literary legacy, and a lot more. We talk about his two new books — Poetry Notebook (Liveright) and Sentenced To Life (Picador, UK only) — and the ones he’s working on, and how he faced two choices after his diagnoses: “Lie back on a couch, admire myself for my achievements, and sign off; or go on as if I had forever.” Give it a listen! We get into the role that culture plays in civilization, the future of the Middle East, his first encounter with a Jew, the books he made a priority of when he realized his time was short, why it’s okay for actors to be shallow, and how he wrote a critique of Daniel Goldhagen while dressed as a mariachi singer for a TV show in Mexico. Born in Australia, Clive James lives in Cambridge, England. He is the author of Unreliable Memoirs ; a volume of selected poems, Opal Sunset ; the best-selling Cultural Amnesia: Necessary Memories from History and the Arts ; and the translator of The Divine Comedy by Dante. He has written for the New York Times Book Review, The New Yorker, and The Atlantic. He is an Officer of the Order of Australia (AO) and a Commander of the Order of the British Empire (CBE). You can find a longer version of his bio at his site. Credits: This episode’s music is El Cholulo by Tosca Tango Orchestra. The conversation was recorded at Mr. James’ home on a pair of Blue enCORE 200 microphones feeding into a Zoom H5 digital recorder. I recorded the intro and outro on a Blue Yeti USB Microphone . Processing was done in Audacity and Logic Pro. Photo of Mr. James by me. During the middle of the High Holidays, two Jews sit down in Manhattan to talk about antisemitism! 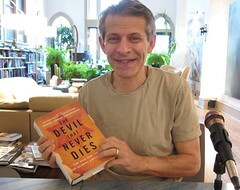 Daniel Goldhagen joins the show to talk about his newest book, The Devil That Never Dies: The Rise and Threat of Global Antisemitism . We discuss the public expression of antisemitism and why it’s permitted in so many regions (and why it’s not in America), how it’s progressed through medieval, modern and global phases, how Jews have been able to survive millennia of ill-treatment, why “eliminationism” is a better term than “genocide”, and how a guy who writes books on topics like this manages to stay upbeat. Along the way, we also talk about the Goldhagen family business, Daniel’s writing routine (which fills me with shame), what it’s like to be the first topic to come up when you search for “genocide” on YouTube, and what the man behind The Goldhagen Debate thinks about the adage that there’s no such thing as bad publicity. The episode also includes my tribute to DG Myers, who died last weekend. Go visit his site to learn more about his life, death, and donations you can make in his honor. You can listen to our podcast from last March here. Daniel Jonah Goldhagen, a former professor at Harvard University, is the author of Hitler’s Willing Executioners: Ordinary Germans and the Holocaust , A Moral Reckoning: The Role of the Church in the Holocaust and Its Unfulfilled Duty of Repair , and Worse Than War: Genocide, Eliminationism, and the Ongoing Assault on Humanity , in addition to The Devil That Never Dies: The Rise and Threat of Global Antisemitism . His writing has appeared in the New York Times, Los Angeles Times, Washington Post, New Republic, and newspapers around the world. There’s a much more extensive bio available at his website. Credits: This episode’s music is First We Take Manhattan by Jennifer Warnes (in tribute to DG Myers). 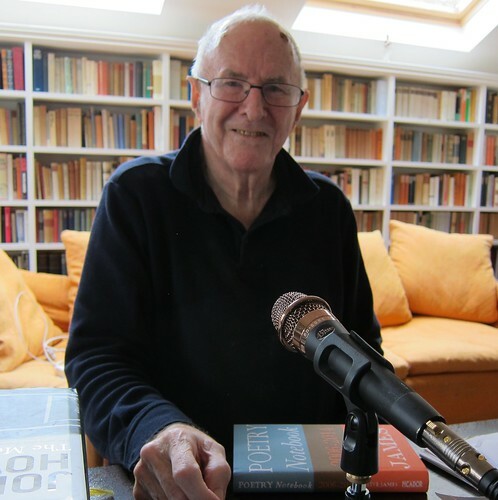 The conversation was recorded at Mr. Goldhagen’s rather echo-y home on a pair of Blue enCORE 200 microphones feeding into a Zoom H5 digital recorder. The intro and outro were recorded on a Blue Yeti USB Microphone . Processing was done in Audacity and Garage Band. Photo of Mr. Goldhagen by me. We also talk about her history in cartooning, why drawing chops aren’t the be-all and end-all, what makes her laugh, the best advice she ever got (from Sam Gross), and her love of Disco, the talking parakeet. Bonus: We bond over our neuroses and I talk a lot! Maybe that’s more like a minus than a bonus. Whatever. 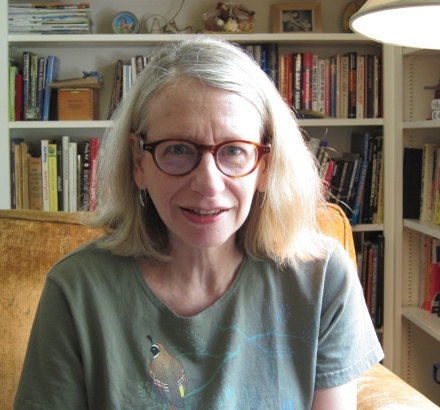 Roz Chast has loved to draw cartoons since she was a child growing up in Brooklyn. She attended Rhode Island School of Design, majoring in Painting because it seemed more artistic. However, soon after graduating, she reverted to type and began drawing cartoons once again. She’s best known for her work in The New Yorker, but her cartoons have also been published in many other magazines, including Scientific American, the Harvard Business Review, Redbook, and Mother Jones. Her most recent books are Can’t We Talk about Something More Pleasant? : A Memoir and the comprehensive compilation of her favorite cartoons, called Theories of Everything: Selected, Collected, and Health-Inspected Cartoons, 1978-2006 . Credits: This episode’s music is Mother’s Love by Tsegue-Maryam Guebrou. The conversation was recorded at Ms. Chast’s home on a pair of Blue enCORE 200 microphones feeding into a Zoom H4N digital recorder. The intro and outro were recorded on a Blue Yeti USB Microphone . Processing was done in Audacity and Garage Band. Photo of Ms. Chast by me. Charles Bivona‘s business card reads, “Poet, Writer, Professor,” but he’s a lot more than that. Over the course of an hour, we talked about what it means to be known as NJPoet, his theory on the transmissibility of PTSD (based on the first-hand evidence of his father’s Vietnam War trauma being visited on his family), the value of building a massive Twitter network, the lessons of growing up poor, how Walt Whitman saved him on one of the worst days of his life, the virtues of a gift economy, and why getting bumped out of academia for blogging may have been the best thing for him. Give it a listen! We also discuss the role of poetry in America today and the poets who saved him in his youth, why he doesn’t publish poetry online, whether Twitter is more like The Matrix or The Watchmen, how his responses to Occupy Wall Street and Hurricane Sandy elevated his online presence, and why it’s important not to put yourself in an ideological cocoon. Charles Bivona would tell you that he’s just trying to help his creative friends figure out ways to reach their goals, to help them in any way he can—writing letters, Twitter endorsements, all-out social media campaigns, word-of-mouth networking. Whatever helps. Otherwise, he’s reading, tweeting, listening to alternative news media, producing blog posts, and writing the first of hopefully several Kindle books and paperback poetry collections. If you push him to be more philosophical, to talk more specifically about the social media strategy that built his audience, he frames his work as a Zen Buddhist approach to engagement based on mindfulness and honesty. With this in mind, he’s gathered an artistic social network that simmers with creativity, compassion, and humor. The writing itself, the poetic prose on his website, is also clearly informed by a Buddhist literary theory, rooted in practical teaching, mindfulness, and a vivid social reporting. Credits: This episode’s music is Ladder of Success by Ted Hawkins. The conversation was recorded at Charles’ home on a pair of Blue enCORE 200 microphones feeding into a Zoom H5 digital recorder. The intro and outro were recorded on a Blue Yeti USB Microphone . Processing was done in Audacity and Garage Band. 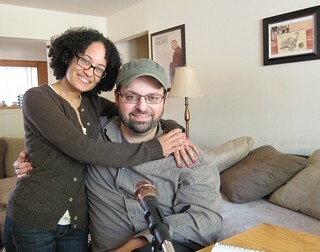 Photo of Charles Bivona and me by Luz Costa. Photo of Charles and Luz Costa by me. 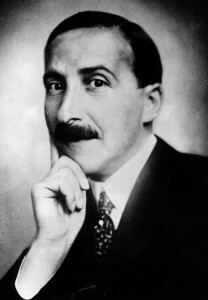 At his peak, Viennese author Stefan Zweig was one of the most widely read authors in the world. How did he and his wife end up in a double-suicide in a bungalow in Petropolis, Brazil? George Prochnik joins us to talk about his new biography, The Impossible Exile: Stefan Zweig at the End of the World (Other Press). We discuss the arc of Zweig’s exile, why Zweig remains important to our age (both in his writing and in his character), how he lost his belief in the power of bildung, the fleetingness of fame and the accident of survival, the role of education in changing political dynamics, the contemporary revival of Viennese culture, the reason why Zweig fled New York City, and more! We also talk about our respective introductions to Zweig’s work, the ways that his final novella may be an allegory for Vienna, the danger of looking for clues to Zweig’s suicide in his writing, and how he may have been the inspiration for Woody Allen’s Zelig. Give it a listen! Go pick up a copy of The Impossible Exile: Stefan Zweig at the End of the World ! And check out my Zweig-shelf! George Prochnik’s essays, poetry, and fiction have appeared in numerous journals. He has taught English and American literature at Hebrew University in Jerusalem, is editor-at-large for Cabinet magazine, and is also the author of In Pursuit of Silence: Listening for Meaning in a World of Noise and Putnam Camp: Sigmund Freud, James Jackson Putnam and the Purpose of American Psychology . He lives in New York City. Credits: This episode’s music is Brazil by The Coasters. The conversation was recorded at Mr. Prochnik’s home on a pair of Blue enCORE 200 microphones , feeding into a Zoom H4n recorder . The intro and outro were recorded on Blue Yeti USB Microphone . Processing was done in Audacity and Garage Band. Photo of Mr. Prochnik by me.